EMI began small with a few selected products and over the years grew to become an industry leader. EMI now offers over 300 diverse products, ranging from the Fireman's 5-in-1 Tool and 911 Tool, Trauma bags, Flashback 5 LED Light Batons, and the TACMED and Think Pink lines. EMI consistently strives to bring our customers a product line that's full of intensity, insight and impact. 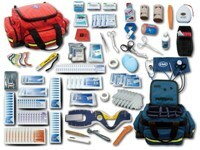 With EMI’s Pro Response 2 Complete you are ready to handle most serious medical and trauma emergencies. This complete kit features our Pro Response™ 2 Bag. The durable and rugged 1000 Denier nylon bag has a removable center section with 11 padded compartments and 3 adjustable sections. The top flap has elastic loops for airways, etc. Two large zippered end pockets are made visible with bright yellow reflective trim. The Pro Response™ 2 Bag has a top carrying handle, an adjustable/detachable rifle sling strap and a star of life reflective emblem on the top flap. It measures 20"L x 12 1/2"W x 9"H.
airways, shears, etc. The bag also has a carrying handle and an adjustable detachable sling. It is trimmed with a reflective Star of Life emblem and reflective yellow trim on both sides of the bag.It measures 14"L x 9"W and 6"H.
Being first on the scene your precious treatment time is limited! Flat Pac’s™ unique design when completely opened lets it lie flat making visible to the rescuer all equipment and supplies with a quick glance. 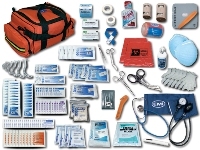 With Flat Pac’s™ complete kit the rescuer is equipped with all the basic supplies to handle first on the scene emergencies. One side of the cordura bag has six gathered deep pockets while the other side has one extra large pocket and five other pockets and many elastic loops to keep all your supplies well organized. Its briefcase style design can easily fit into places a bulkier larger bag cannot. Flat Pac™ has yellow reflective trim and a star of life emblem on both sides. It measures 16"L x 9 1/2"W x 5"D.
The Rapid Response Pac™ is designed for first on the scene or officer trauma emergencies. For severe bleeding the Rapid Response Pac™ provides the officer with Quick Clot, a superior blood clotting material. The kit features our low profile black fanny pack, which has three outside pockets and two large zippered inside pockets to keep all supplies and equipment organized. It has an adjustable nylon webbing that can fit 20" to 54" waist with a quick release buckle. 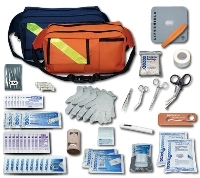 The pack measures 10"L x 6"H x 5"W.
Trauma Pac™ kits offer the essential basic life support components for the first responder. Trauma Pac™ features EMI’s fanny packs. 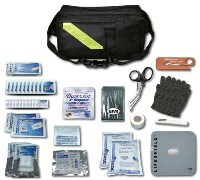 These packs have three outside pockets for instruments, seat belt cutter, gloves, etc. Two large zippered inside pockets can easily hold all supplies and equipment. The adjustable nylon webbing can fit 20" to 54" waists and has a quick-release buckle. The reflective trimmed pac measures 10"L x 6"H x 5"W.
The Thermal Rescue Blanket is constructed with an aluminized material that reflects back 90% of body heat. Flexible, weatherproof, warm and compact this blanket can fit easily into fanny packs, holsters, shirt pockets, etc. Ideal for shock, hypothermia and most disaster situations. Unfolded approximately 52" x 84".